My mom is the sweetest mom on earth! Hey, what can I say? She is my mom!!! She is always there when you need her and when you don’t she is also there. She is the most generous person on earth, she loves making presents… she has gold hands: she can cook the best dishes, she can build neck glasses and earrings, she kneads babies’ sweaters, she paints… Don’t get too excited boys, she has married the most wonderful man in the world… what can I say? He is my dad! 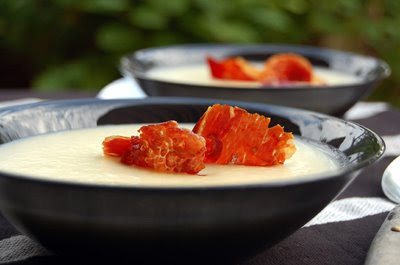 My mother is a source of inspiration for me and she is also the best guest because she always tells me how great the dish was, which is one of the best compliments a cook can get :D.
So, here you have this Vichyssoise with Iberian Acorn Ham, a dish she taught me long ago. A perfect marriage between French cuisine and Spanish products. 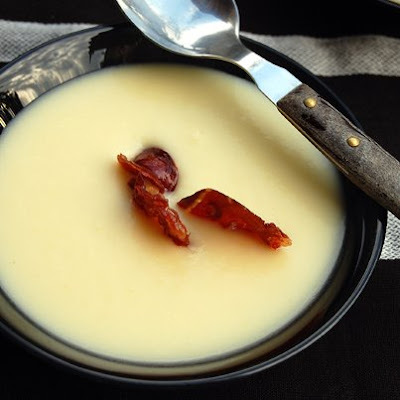 I’m sending my Vichyssoise over to Ivys and her new event: ♥ Celebrating Mother’s Day ♥, come join and send your recipes; you still have time until the 10th of May. 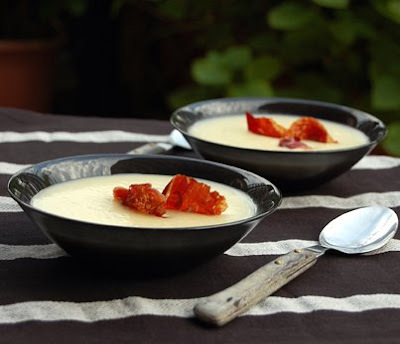 This is such a delicious soup/puree/cream … whatever :D. Now that warm days are here, have it cold and for those of you in the southern hemisphere have it warm. It will make you feel good for sure! Ingredients for 4 servings: 5 medium leeks, 1 season onion, 4 medium potatoes, 1 liter of vegetables or chicken stock, 3dl of cream, 100 grs of butter and salt. 50 grs of Ham. Discard the leeks green leaves and cut a cross with the knife on top so that all leaves get separated, this way you can clean it in depth. Cut in small pieces and reserve. Peel the onion and cut in small pieces. Reserve. Prepare a sauce pan in low heat and place the butter inside. Once it stars melting, add the onion and leeks and cover with a lid (a lid with a little hole would be perfect). When the leeks and onion loose their white colour, throw the peeled and cut potatoes in. Pour half the chicken or veggies stock, add a bit of salt and let it boil until potatoes become tender. Use a food processor to get a fine texture and strain in a fine colander. Add more stock to get the texture you like best. Once cold, place in the fridge. Only when you are ready to serve it, add the cream and mix well. Taste and add more salt if you consider it necessary. Preheat the oven at 220 ºC and when ready place the ham between two layers of oven's paper. Heat for 5 minutes and the ham will be ready. You can also avoid the oven's step and cut in small strips and place on top the vichyssoise (I prefer the second option). So now we know how you got to be so simpatica! Interestingly, while I know the term vichyssoise, I know I have never made it and I’m not sure I’ve even tasted it. I’ll have to give it a try. Ahora, your photography has gotten really good…I’m very impressed. What camera are you using? P.S. Happy Mother’s Day to you and your Mom. Happy Mother’s Day – what a beautiful post. Your mother sounds perfect! Nuria, encontre tu blog hoy y que alegria me da! Es precioso y me encantas tus recetas autenticas espanolas. Te seguire visitando para nutrirme mas con la comida tradicional de tu pais de maravillas! Visite Espana por primera vez hace un par de meses y me quede enamorada de todo: la gente, los paisajes, la cultura y, sobre todo, la comida!!!! They say the apple doesn’t fall far away from the apple tree and they are right, or like mother, like daughter. I can see from the photo that your mum is such a lovely person. Happy mother’s day to your mother and to you since you are a lovely mother as well. You have convinced me to try this delicious soup but unfortunately it will be without the Iberian Acorn Ham. Happy mother’s day to you too Giz! I know your daughter cannot complain either ;D. My mom is in very good health, thank you! Hola Marta! Bienvenida a Spanish Recipes :D. Celebro que te guste y espero que encuentres recetas que puedas hacer en casa. Voy a ver tu blog ya mismo! Hasta la próxima. This is beautiful! Mom can always give the best and honest comment, isn’t it? Now being far away from home, I realised I have actually learn a lot from her. Glad I have helped her in the kitchen when I was little. You and your mum looks so cute together Nuria! You have expressed such beautiful words about her…oh yes! and I like the sopa too con the Iberian ham! You look so much like your mom, Nuria. What a great post and even better looking food! Wow Nuria! Happy Mother’s Day both to you and your sweet mamma! I love that photo of you two, you can just see how much fun you have together. I love your vichyssoise, it looks so delicious! I hope you have a great weekend – and congrats on your Joust win!!! :) Hugs! Congratulations on your JOUST wins! I aquesta vichysoisse, ha de ser senzillament deliciosa!! Hola Maria José! Sí és la meva mare i jo, has encertat! Ella es mereix totes les paraules carinyoses del món… com totes les mares, no? 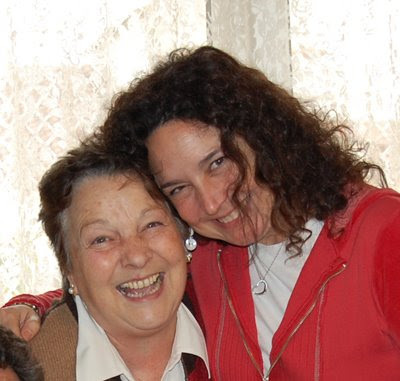 Hola Janet, moms are the best and stronger influence in our lifes and distance cannot do anything against that! I’m sure your mom is lovely and sweet as you are! Thanks darling Peter :D. There will be a bowl for you ready here always!!!! Aaaahhhhh thanks Jenn. Thanks for everything!!!!!! Thank you Eating Club! I’m superexcited with it!!!!!!!! And thanks for participating in the contest. I wish you good Luck! Hi there Ham Recipes! I’m happy you like it :D. Buen provecho! Hola Mercè! Sí, mai no farem prou per elles… Un petonàs! Hola Nuria, te iba a decir… por tu nombre seras española, pero veo que aparte de española… ets catalana. Molt maca la foto amb la mare. oh yeah nuria.nothing like some iberian ham as “crutons” – ha haha. this looks creamy and really perfect for what i’m craving right now. someone should make a bag of those ‘crisps’ to eat as your watching a movie! 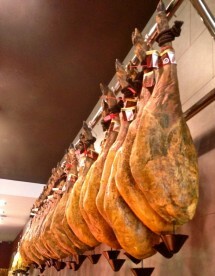 Nuria – I am salivating looking at that ham – oh how I miss Spain! I love your post about your Mum as well. And I adore that you have a rabbit recipe, I love rabbit but I seem to be in the minority. Have a great mother’s day. Hola Margot i benvinguda :D. Gràcies per deixar un comentari. Sí, el fet de tenir-lo en anglés despista una mica, no? Hola Amy :D. That’s a great idea! Why don’t you pattent it? Thanks so much Prue and welcome to this blog! I’m glad you enjoy rabbit recipes… I think it has one of the best meats :D.
Nuria, you have one of the most infectuous smiles and now that I’ve seen your mom’s photo…I know where you got it! 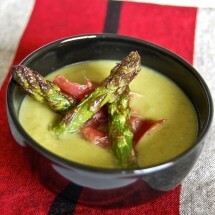 A belated Happy Mother’s Day and enjoy a summer of cold soups.